I would like to wish all my friends and blog followers Eid Mubarak. May Allah shower you and your family with happiness, peace and prosperity. When I was browsing through Tarla Dalal’s recipes one day, I came across the recipe for akhrot choco tarts and thought that I must try it out one day. I did and it turned out very very sweet in spite of using dark chocolate as the filling. So for this Eid I tried it out again, making quite a few changes and loved the end product. A few days ago I was weighing out the idea of making normal kheer or tarts. Tarts won and I am glad that I did try out the recipe again. Usually failed recipes are forgotten but this one was not as I wanted to make something special for Eid. I know the recipe has been posted a few days earlier but as you may have read the last blog, I am off to Nairobi to test my patience at the waiting game 🙂 So once again a very happy Eid to you all. Put the cream in a heavy bottomed or non stick pan. Heat it over low heat till it becomes hot. Add the chocolate chips into and stir till it melts. Take the pan off the heat. Add sugar and essence and mix well. Put sugar in a small pan along with the water. Heat it over low heat. Stir till the sugar melts. Let the mixture simmer over low heat till you get a one string syrup. This takes less than 5 minutes. To test if the syrup has reached a one string consistency, put a drop of the syrup on a saucer. Let it cool a bit and then press it between your thumb and first finger. When you lift the finger, a half cut string should appear. When the syrup is ready, add the nut powders and orange zest to it and mix constantly. It is ready when the mixture comes away from the sides of the pan and forms a ball. Let the dough cool down completely. Lightly grease the moulds you would like to use with a bit of butter or ghee. Take a teaspoonful of dough and pat it out into a small circle. Press it into the mould. Use a little ghee or butter on your fingers if the dough sticks. Leave the tart in the mould for a while and then remove it gently. Repeat steps 6 and 7 with the remaining dough. Put the chocolate mixture (ganache) into a piping bag or piping tube. Pipe the ganache into the tarts. Decorate with sprinkles, silver or gold balls or nuts. While processing the walnuts, process in short bursts and not continuously as walnuts are oily and you will land up with an oily paste. Add flavouring of your chose. Add powdered sugar to the ganache only if it tastes bitter. It depends on the type of dark chocolate you use. I had about 2 tbsps of ganache left. Store it in the fridge to use for topping on a dessert, ice cream or muffin. The number of tarts you will get will depend on the type and size of mould you use. If you do not have any moulds, shape the dough with your hands into tiny cups. 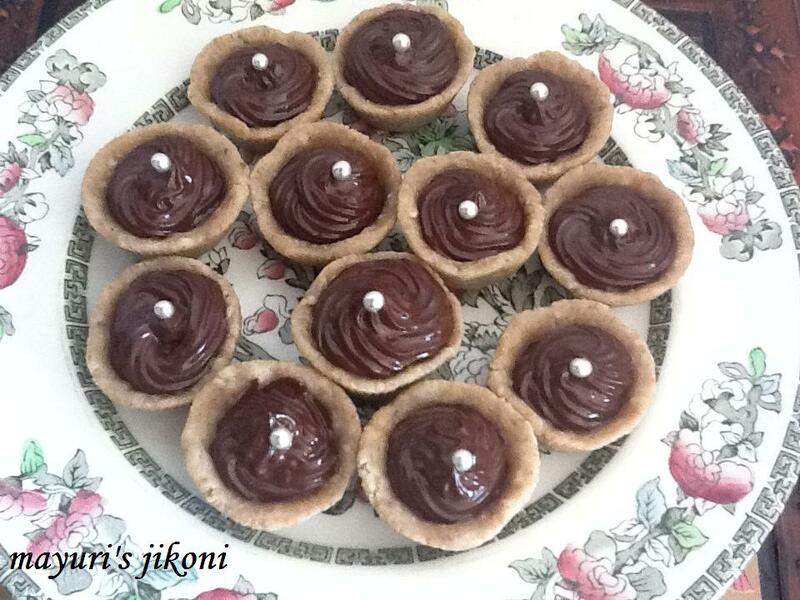 If you do not have a piping bag or tube, spoon the ganache into the tarts. Beautiful tarts Mayuri Love it. Delicious tart..and thanks to link this to my event..
super delicious tart!!! Thanks for linking it to my event!! Looking for more yummy recipes! !